Looking for a healthy quinoa recipe or wondering what's the best way to cook quinoa? Look no further! Here are some favorite fabulously easy and healthy vegetarian ​and vegan whole grain quinoa recipes. Most people are probably introduced to quinoa through a simple quinoa salad of veggies and dressing, much like a pasta salad. Quinoa salads don't have to be basic, however, and you can add everything from blueberries to fresh mint to spice it up. Or, keep it simple with a quick and simple easy vegan quinoa salad. Have you ever tried breakfast cookies made from quinoa? Quinoa and spinach muffins or quinoa with chocolate and peanut butter? There are several interesting ways to incorporate quinoa into a healthy, vegetarian and often vegan and gluten-free breakfast. Got leftover quinoa and not sure what to do with it? There isn't usually leftover quinoa because it's always being used for another recipe. Here're a few ideas for using up your extra quinoa, whether it's leftover or planned-over. Roasted acorn squash is filled with an easy yet delicious balsamic and raisin quinoa pilaf for a beautiful vegetarian main dish recipe. Use this quinoa recipe for a healthy vegetarian Thanksgiving or serve it at another special fall dinner. Don't be intimidated by the beautiful picture – if you can boil water and cut a squash in half then you can make this easy vegetarian and vegan quinoa recipe. The little hearts on the plate perfectly capture how we feel about this super easy quinoa and pesto recipe. Sure, pesto makes everything taste better, so this recipe, using store-bought pesto, almost seemed too easy. Almost. We love the spinach wilted into the dish, and the texture of the pesto was just perfect with the quinoa. If you want to make it a bit more of a full meal rather than a side salad, a few tomatoes or chickpeas tossed in ought to do it. This Greek salad-inspired quinoa recipe is one of our all-time highest rated vegetarian recipes. Everyone just absolutely loves this dish! It's made with a simple lemon vinaigrette, fresh herbs, kalamata olives, artichokes and tomatoes for a quinoa recipe that can be a main dish in itself. Absolutely delicious. A versatile quinoa salad recipe, this quinoa, and black bean salad are made with Tex-Mex and southwestern influences: it's got black beans, corn kernels, and fresh cilantro in a with a squeeze of lime juice. It's simple enough to pull together quickly, and with black beans, it's extra high in healthy vegetarian protein. 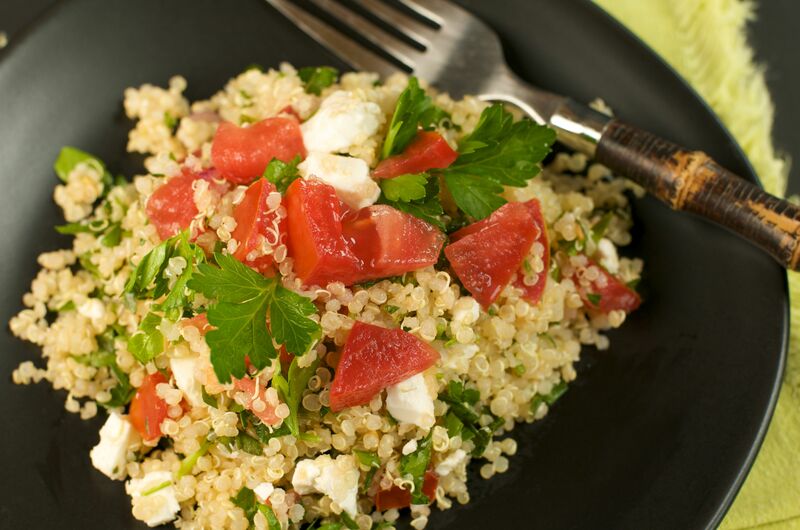 Perfect for vegetarians and vegans, and, this quinoa salad recipe is gluten-free as well. With ingredients similar to an Indian-inspired rice pilaf, this easy whole-grain curried quinoa recipe will make for a familiar side dish, if you like Indian flavors. Add some simple curried veggies to make it more of a full meal, if you'd like. If you like Indian food, you'll like this easy vegetarian and vegan homemade quinoa dish. Filled with quinoa and spinach, this vegetarian quinoa casserole recipe is a healthy twist on traditional comfort food and southern-style baked macaroni and cheese casserole. If you need this recipe to be gluten-free, use cornstarch or a gluten-free flour in place of the regular flour, since all of the other ingredients are wheat- and gluten-free. It has all the same flavors and ingredients as a traditional stuffing, and it will still fill your kitchen with that lovely Thanksgiving smell, but this stuffing recipe is made with quinoa and just a couple pieces of bread for a healthier, high-protein meatless stuffing. If you're looking for a simple, quick and easy quinoa side dish recipe, this quinoa with garlic and Parmesan is a good one to try as it's quite simple, yet the flavors are all familiar. Cooked with plenty of garlic and cheese, this recipe is a bit like macaroni and cheese. To make it vegan, simply substitute nutritional yeast for the Parmesan. Can't get enough homemade quinoa meals? We know the feeling! Here are a few more healthy meat-free quinoa dishes that pile on the flavor, including lots of fresh herbs, low-fat recipes, breakfast quinoa recipes, and more. Enjoy!